1989 was a very busy year for Vekoma, with four new products that premiered to the world. The first was Vekoma introducing its very own looping coaster trains. They were an improvement to the Arrow train, with padded seats and a more comfortable restraint. The best way to tell the Arrow and Vekoma trains apart is to look at the nose of the front car: the Arrow cars have a pointed nose and the Vekoma cars have a rounded noise. Those were the “first generation” cars and were first used on the “Kamikaze” at Hunt’s Pier (Wildwood, NJ). 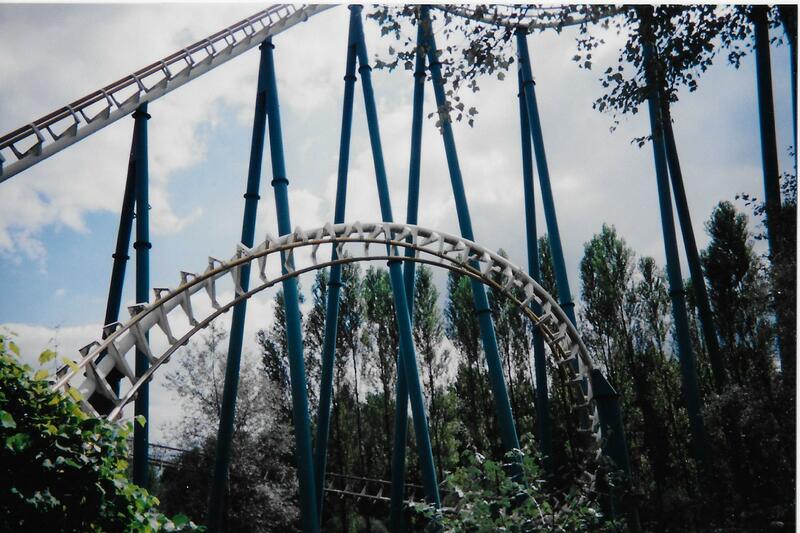 Kamikaze was sold to Six Flags after the park closed in 1991 and moved to Six Flags over Georgia (Austell, GA) as the Ninja in 1992. It ran the two original Vekoma trains until 2011. Vekoma first generation looping train. 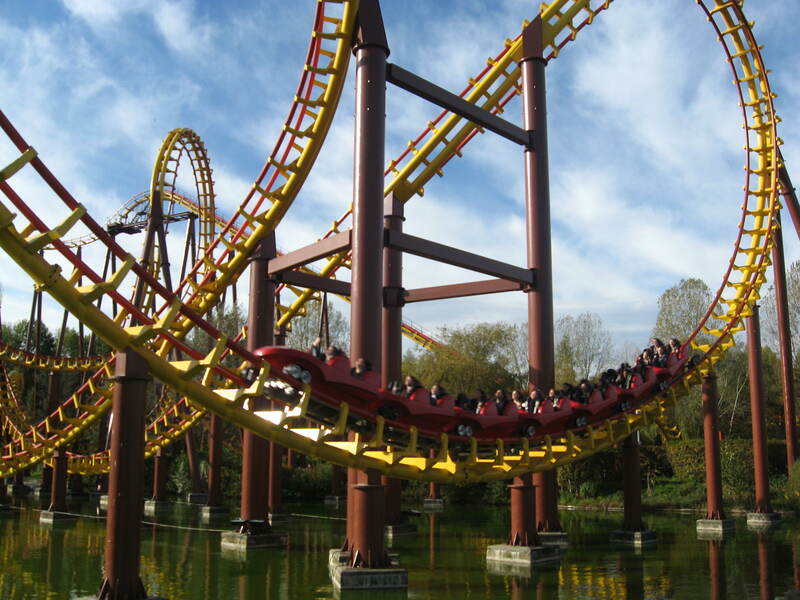 The French Revolution at Lotte World (Jamsil, South Korea), Kamikaze and Goudurix at Parc Asterix (Plailly, France) were the first 3 Vekoma MK-1200 Custom Looping Coasters to be designed and built entirely by Vekoma. French Revolution was a difficult ride to design, as it was to weave in and out of rooms and buildings, while having to fit inside an indoor theme park. So, Vekoma came up with a brilliant layout that feature the spinning transfer track after the station to save space and then a steep lift going up to the roof. After the first drop, the train does a half enclosed “Bayern Curve” (Helix) before going through a lighted tunnel. 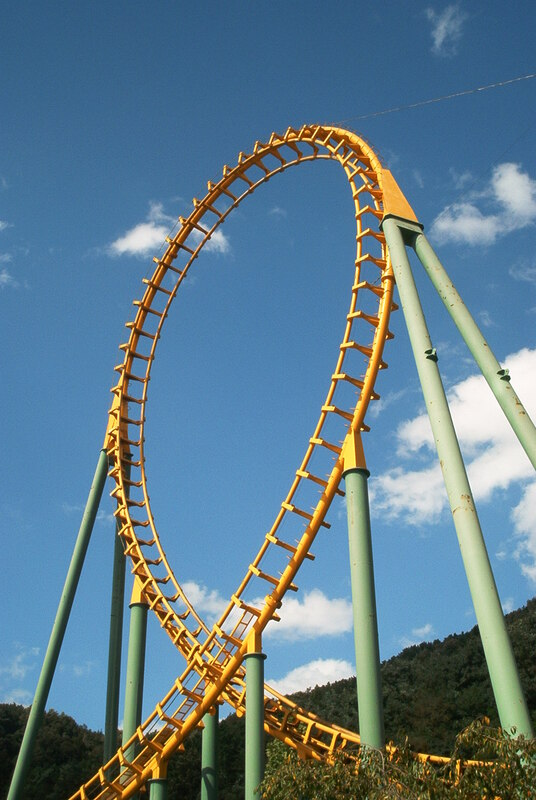 A sharp curving drop then leads to the Vertical Loop. What make it unique is that a park pathway goes through the middle and people can stand in the middle while the train goes around. The train then rises up to a straightaway that is over the station. A speed reducing brake was to be originally installed there, but it was not deemed necessary. The train then drop into another Bayern Curve that led into the final brake run. The Bayern Curve with the fountains and lights in the middle. 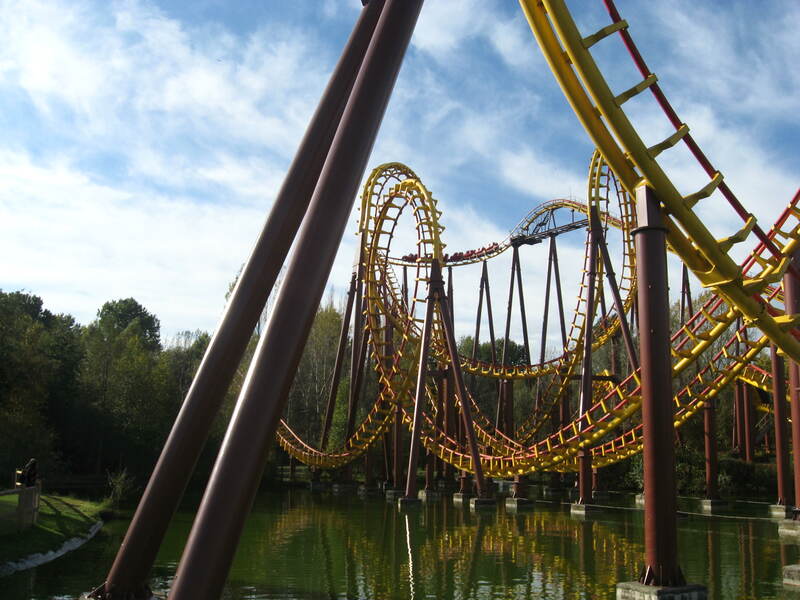 Kamikaze and Goudurix are both large multi looping coasters and both featured a brand new inversion that was made possible by the AUTOCAD programs that Vekoma started using in 1987. It basically was a half loop, a twisting half roll down, another twisting half roll going up and a half loop going down. Unfortunately, the Butterfly was a jarring experience for riders. Further modifications were done in 1990, but it still remains an uncomfortable portion of the ride. 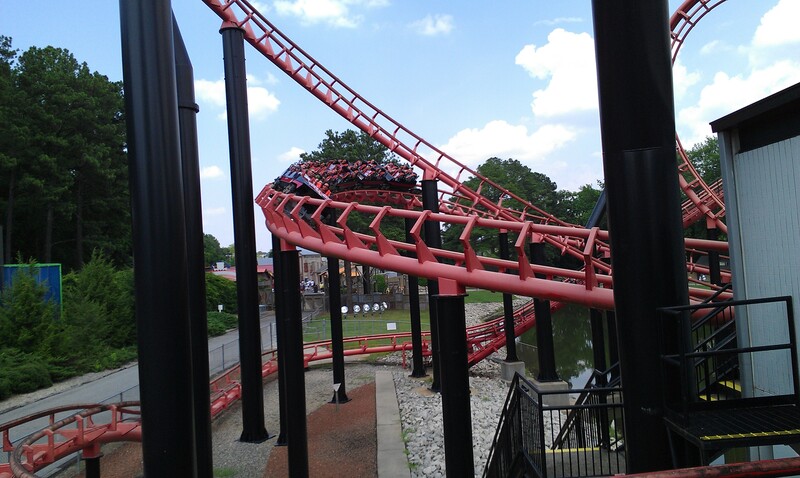 After the Butterfly, Goudurix goes up into a modified version of the Arrow “Boomerang” inversions, which consist of a half corkscrew, half loop down, smaller half loop up and a half corkscrew sending the train back toward where it came from. The rest of the ride consisted of a standard loop and two corkscrews. Kamikaze was a much more compact ride and featured an elevated turn leading into a reverse sidewinder (half corkscrew into a half loop down) and then two corkscrews in the lower portion of the ride. Ninja’s Reverse Sidewinder is in the background. The high turn that leads into the Reverse Sidewinder. 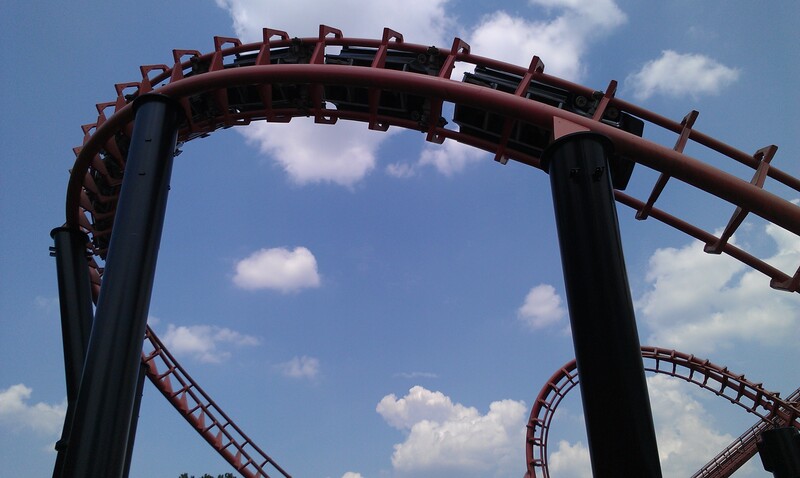 The curve that leads into the Double Corkscrew. The train going through the bottom of the Double Sidewinder (Arrow Boomerang element). 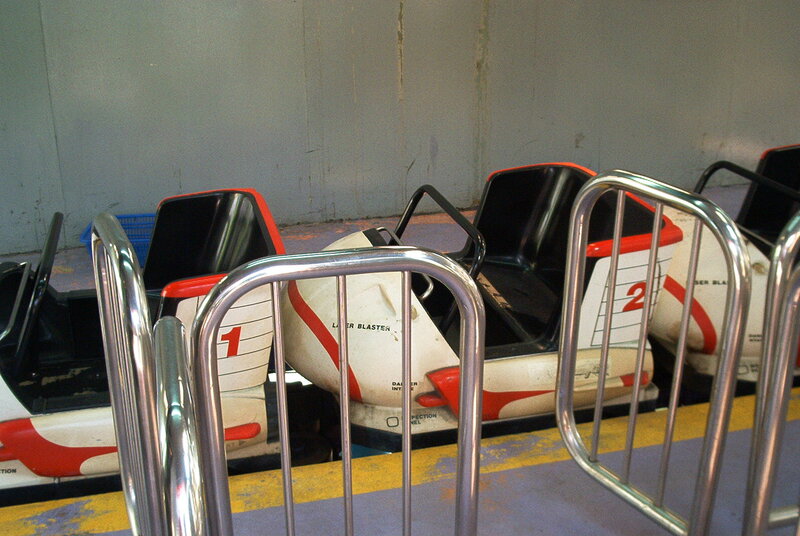 This picture shot in 2001 shows the ride with its second paint job. This shows the Butterfly. Goudurix first Corkscrew. It was originally all white and in the mid 1990’s, repainted with yellow rail, white track ties and spine and green supports. The third product introduced was a new compact coaster layout. 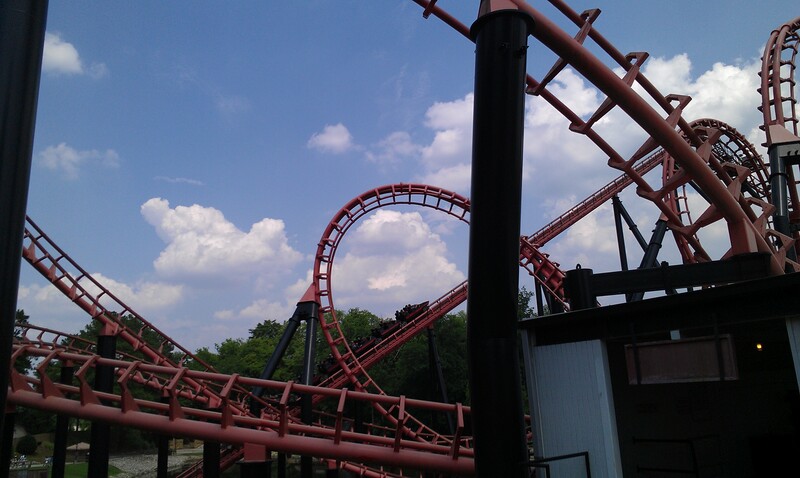 Known as the “Hurricane”, it featured in a similar footprint to the original Corkscrew a taller lift, a vertical Loop, a double Corkscrew and a larger Bayern Curve. 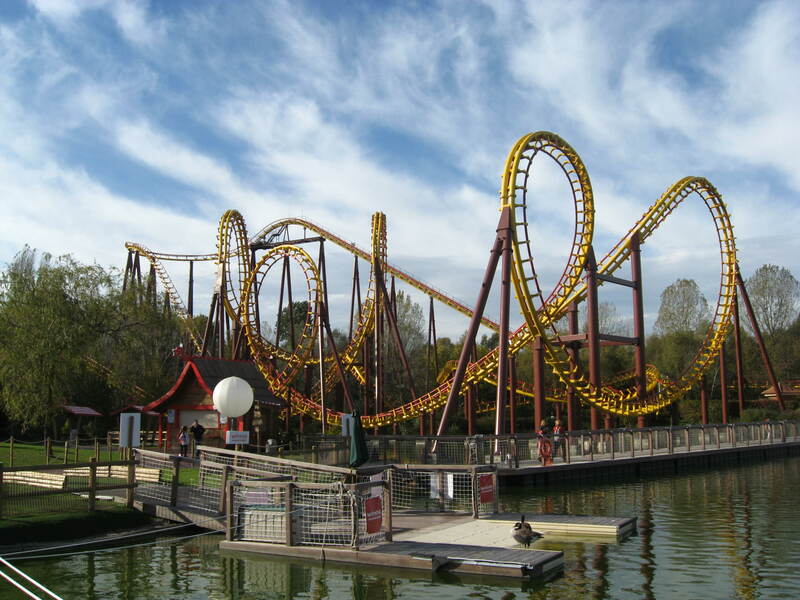 It was sold to Big Bang Schtroumph (Metz, France) as one of their opening day attraction. It also featured impressive capacity, running two 28 passengers trains. 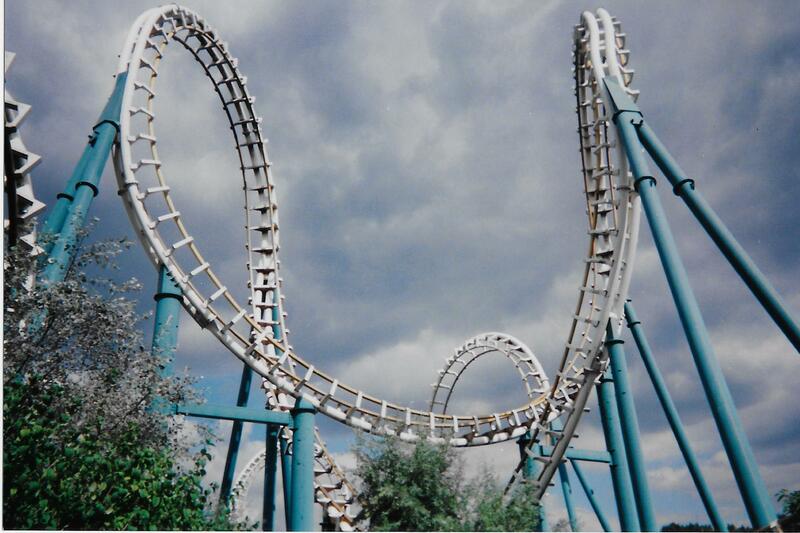 In 1995-1996, the owners of Fiesta Texas (San Antonio, TX) purchased another Hurricane for their park and when Six Flags took over the park management, Joker’s Revenge two trains got flipped around and operated backward. 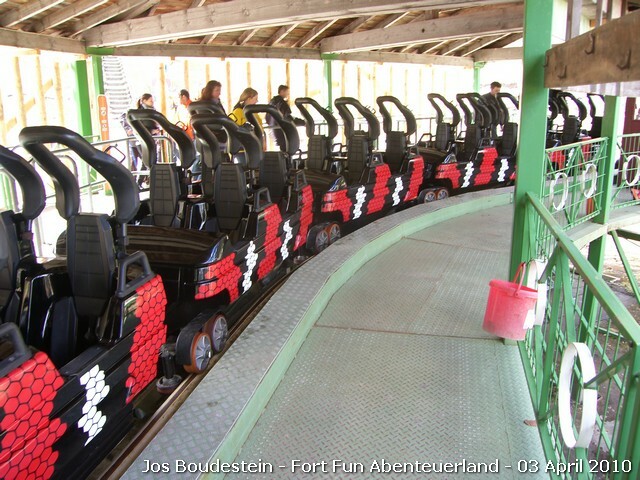 Joker’s Revenge was also the last Vekoma ride to be sold with Arrow trains. The ride was moved in 2003 to Six Flags New Orleans (New Orleans, LA) and it ran there as the Jester until the park closed in 2005. The closure was due to extensive damage suffered through Hurricane Katrina. The last product is possibly the oddest Coaster Concept ever. The “Illusion” was first presented at the IAAPA Expo 1987 and was sold to two parks: Opryland in Nashville, TN (Park closed after the 1997 season and the ride was never rebuilt) and Bobbejaanland in Lichtaart, Belgium. The Illusion consist of the MK-700 track system and it feature either a 30 or 40 cars train, which made the Chaos at Opryland (which ran the 40 cars train) the longest coaster train in the world at 180 feet long. Obviously, the station is curved around part of the custom Vekoma designed building in order to accommodate the train. The ride consisted of 3 rooms: the station, the outer room and the inner room. The ride started with a long spiral lift hill around the side of the inner room. The train is tire driven and while it was moving toward the top, music played and two screens ran their program. There were screens at the bottom and top and both were synchronized. Other effects also occured as the train was going up. At the top, the train transition to the outer room and it start going down into an extended convoluted helix with effects and show scenes before going back to the inner room for the finale where it reached 30 mph. Both attractions were extensively modified through the years, as guests tended to drop items while going up in the inner room, which caused extensive damage to the bottom screen. 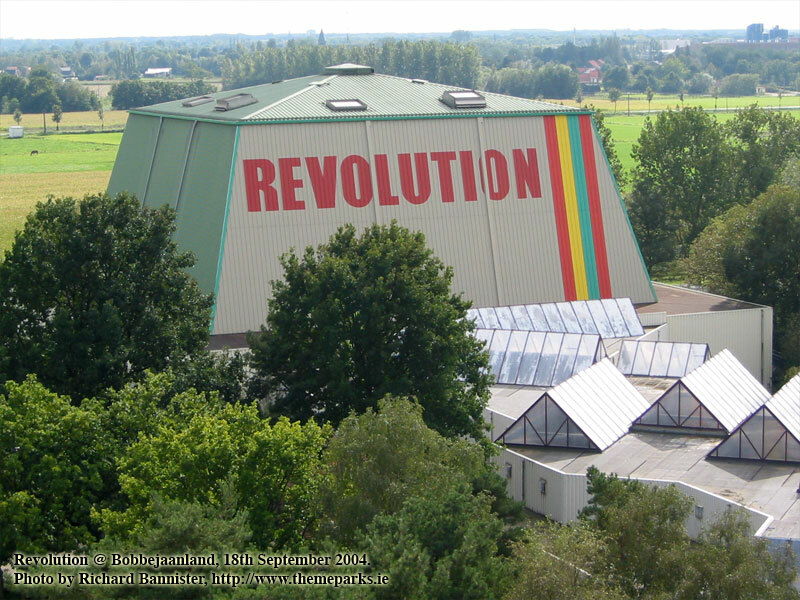 For the 2011, Bobbejaanland restored Revolution to its original condition. Only two Illusion were sold, as their large initial investment (7 millions USD in 1989) and large maintenance costs due to the on-ride effects pushed parks toward other projects. Vekoma supplied Sidewinder to Hersheypark (Hershey, PA) in 1991 and it was the first Boomerang to feature a Vekoma train. 1992 was a very busy year for Vekoma. First, they sold a small Junior Coaster 85m to Fiesta Texas (San Antonio, TX). Pied Piper featured a short 276 feet long oval layout and was a great kid roller coaster. Second, Vekoma designed a new track system called the MK-900m. It is the same size as the MK-900 previously discussed, but the guide wheels went back inside the running rails and special mounts were installed on the track spine, so wooden boards can be installed to simulate railroad track. Marketed as a Mine Train, the ride cars were patterned after far west mining trains, complete with a locomotive upfront. Two rides opened in 1992: Colorado at Walibi Wavre (Wavre, Belgium) which is now the Calamity Mine at Walibi Belgium and Big Thunder Mountain at Disneyland Paris (Chessy, France). Calamity Mine is known as a Mine Train 785m (2575 feet long) and features a mostly square layout with two parallel lift hills in the middle. The ride can run 3 trains and the biggest difference with Big Thunder Mountain is that while Calamity Mine has 4 cars + locomotive per train, there is a row of seat in the cab of the train engine. Big Thunder Mountain has 5 cars + locomotive per train, but going with the storyline of a crazy out of control train, the cab has no seats. This picture of Calamity Mine appears courtesy of Richard Bannister and his website http://www.themeparks.ie/. 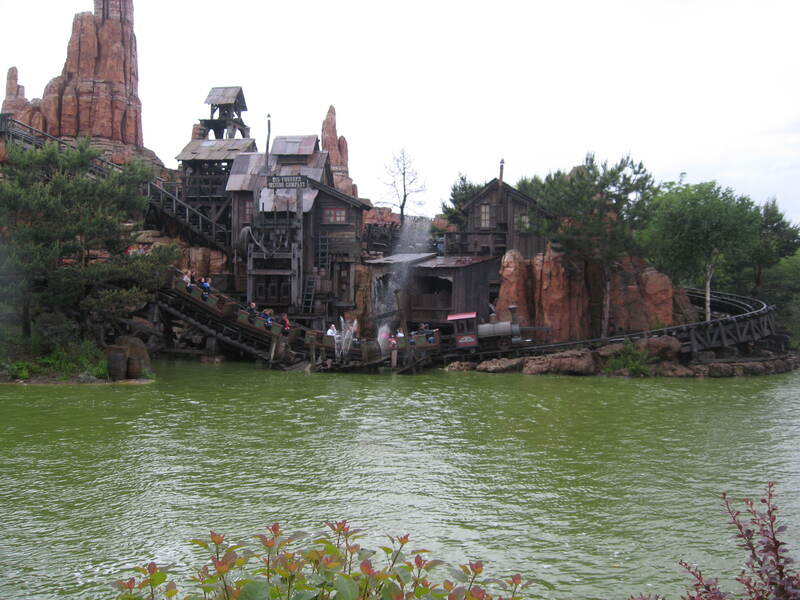 For Big Thunder Mountain, Vekoma started working from Bill Watkins plans to design the ride. Back in 1977-1978, Bill Watkins was the Head Mechanical Engineer for Walt Disney World and is credited with coming up with the method to design smooth roller coasters. So, he designed the layouts for Space Mountain at the Magic Kingdom (Walt Disney World, Lake Buena Vista, FL), Space Mountain at Disneyland (Anaheim, CA) and Big Thunder Mountain Railroad at Disneyland (Anaheim, CA). In the case that interests us, Vekoma took the California Big Thunder Mountain design and expanded it to fit the very unique requirements for the Paris installation: a 4921 feet long ride built on an island in the middle of a river. A large tunnel divided in two would lead the trains from and to the station under the river. The ride was delivered on time and is still running great 22 years after opening, with one of the most intensive use of any ride today. 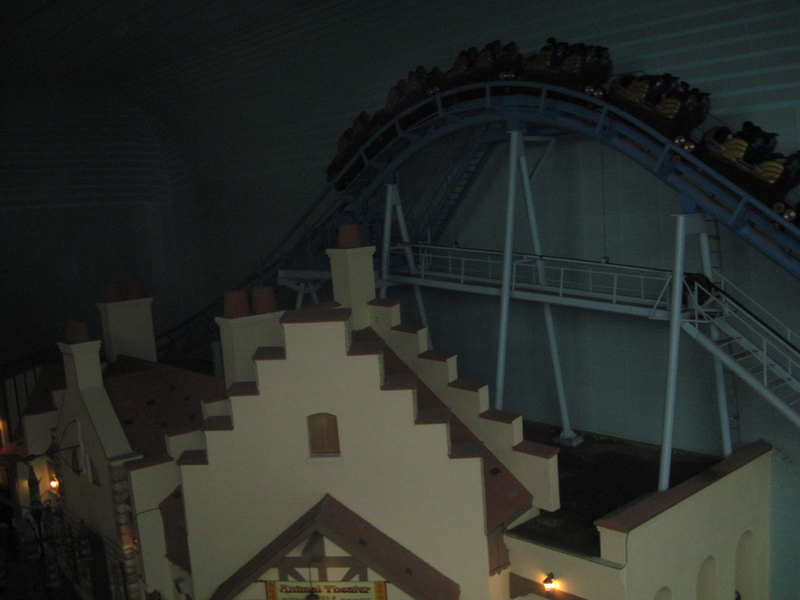 Vekoma provided the track and trains and Walt Disney Imagineering installed the ride control system and other effects, such as a “shaking” lift effect where the ride third lift actually move as the train goes up to simulate an earthquake. You can see the return track leading back to the station on the right and the track leading to the large garage on the left. The ride features 5 separate maintenance tracks and a complicated network of sliding transfer track send the train to the correct one. The other side of the mountain with the track going back inside for the ride’s final drop. The shaking lift illustrates Vekoma’s greatest strength: their “we can do anything for our customer” attitude. Be it adapting to a brand new launch system as we’ll see later or a shaking lift, Vekoma will work with the park or design firm and come up with a solution that fit everyone’s needs. Vekoma has an impressive design department that will design car bodies for its rolling stock that fit any clients special need. A Lego Dragon, a space rocket, a steam punk machine: Vekoma will come up with something special to make the ride stand out. The Big Thunder Mountain splash down drop, where water cannons simulates the train diving into the river. The curve before B lift was modified to receive a new system with anti rollbacks. The reason for this is that in the case of a train that is stopped on the brake run before, the train won’t make it to B lift and will valley in the splash down drop. By holding the train in the curve, it is much faster for maintenance to bring the train to B lift. 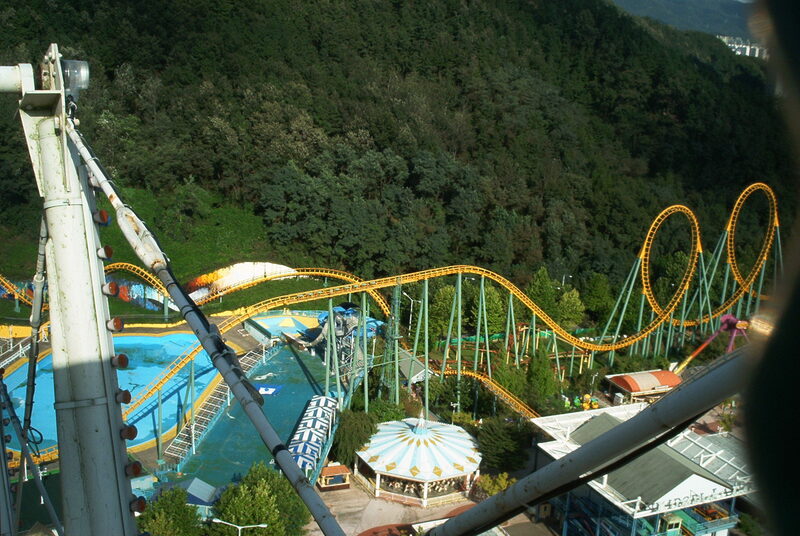 1993 saw Vekoma sell a 3 coasters package to the 1993 World Expo in Daejeon, South Korea. One ride was a standard Junior Coaster 207m with a regular Roller Skater train. The other was a brand new model called the “Enigma”. 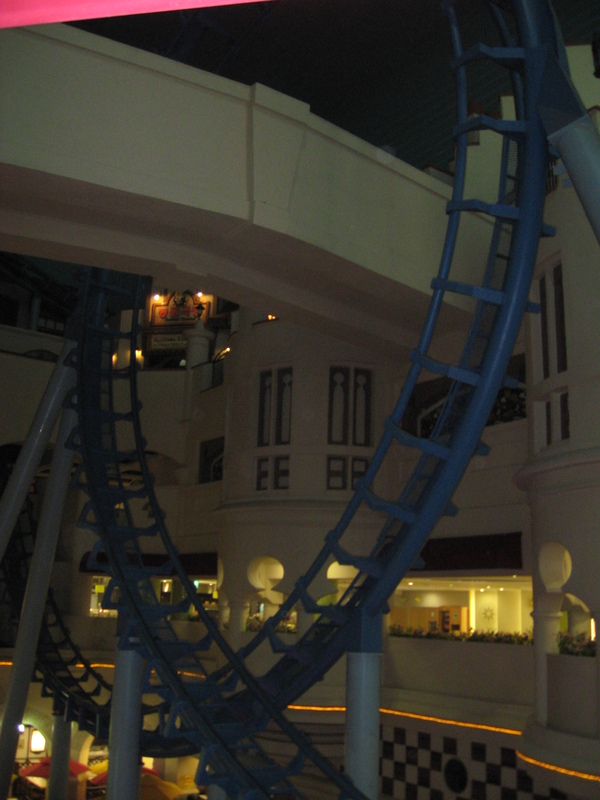 It is a basically an enclosed Junior Coaster that use the MK-700J—Indoor track system. In this case, Space Adventurer used rocket trains and had a split lift hill. The third ride was the Black Hole Express/Horror Express. It was the tallest Custom Looping Coaster Vekoma has ever designed and it has a 171 feet tall lift hill, followed by a unique drop that features a helix. It is followed by two very large loops that are each over 100 feet tall. The train is then slowed by a mid course brake and then plunge into a Reverse Sidewinder. The train then goes through a tunnel and then do two Corkscrews and then rise into the brake run. It ran two 7 cars Vekoma trains and was an exceptional design. After the World Expo, the park stayed open as Kumdori Land until 2012 when it closed. The fate of the 3 roller coasters is unknown, but Black Hole Scramble was Standing but not operating in April 2009. Here are some of the Space Adventurer cars. Here is part of the layout for Black Hole Express. Those are the largest loops Vekoma has even built for a MK-1200 coaster. One of the two loops. This entry was posted in Coasters, Industry Profile and tagged Big Thunder Mountain, Bobbejaanland, Coasters, Disneyland Paris, Enigma, Goudurix, Junior Coaster, kentucky kingdom, Leofoo Village, Lotte World, Parc Asterix, Roller Skater, Six Flags Over Georgia, South Korea, Vekoma, Walibi Belgium. Bookmark the permalink. 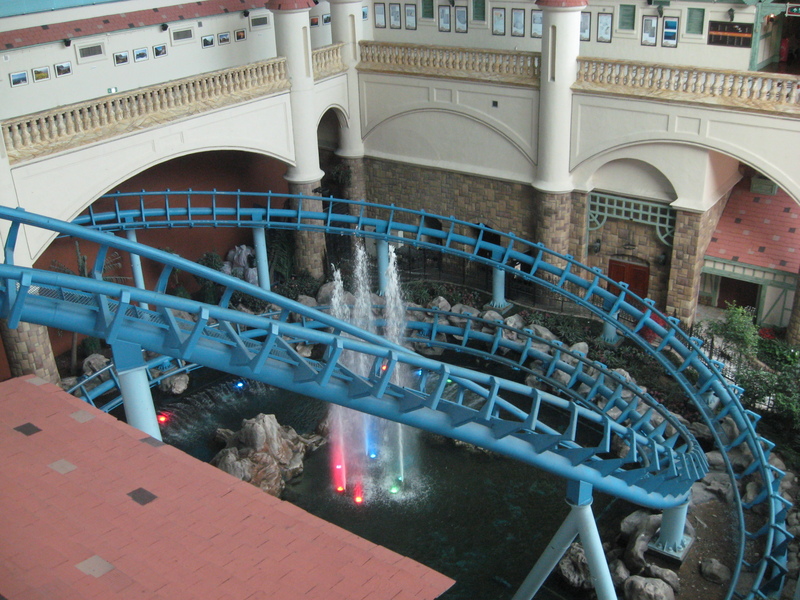 ← Indoor and Swinging Coasters around the world: part two of the Vekoma retrospective.